If we are lucky, we will grow old. Most of us have grey hair, wrinkles, frailty, loss of memory and degenerative diseases to look forward to - if we do not have them already. It is not all bad news. With ageing, we can acquire wisdom and often become more emotionally stable and at ease with life. But the downsides seem to far outweigh the perks. We live in a youth-oriented world. California epitomises a society where everyone wants to be young, attractive and vibrant. Being old, looking old, acting old is not an option, so much so that after many years operating as the University of California's Ageing Centre, in Los Angeles, the name was changed to Longevity Center, to "give it a more positive spin," according to its director, Dr Gary Small. "Ageism - prejudice against old age - is a tremendous problem," says Dr Small. 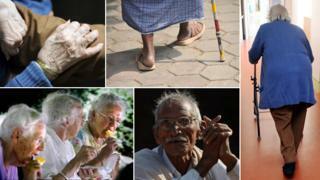 "People need to understand that older people are just people. As soon as you understand that, you can get over that ageism and that fear. Part of it is our own fear of death and of ageing ourselves, so we want to deny that natural process," he says. Scientists have long been searching for the key to a long and healthy life and experiments can throw up unlikely results. A stress-free existence is often put forward as recipe for a long life, but a study by Dr Lewis Terman at Stanford University in 1921 refutes many commonly held beliefs about lifestyle and lifespan. It followed the lives of about 1,500 people from childhood to death and set out to match behavioural traits and actual life events with how individuals thrived in later years. For the past two decades, the research has been updated by Howard Friedman, a professor of psychology at the University of California at Riverside. "We looked at those people who were the most persistent, most hard-working, most involved, and achieved the most success, and often that was the most stress - those were the people who stayed healthier and lived the longest," he explains. "The people who said, 'I don't stress, I take it easy, I retire early,' - those were the people who tended to die at a young age. That was really surprising and it goes against what a lot of advice that we hear." According to the study, a little worry is also a good thing. The benefits enjoyed by people who lead a conscientious life were also highlighted. "They tend to have healthier habits," he adds. "They're less likely to smoke, they're less likely to drink to excess. But we also found that the people who were conscientious tended to succeed more in their careers, which is a good predictor of health and long life." The project also suggests that people who lived a more worthwhile and socially responsible life, helping others, being involved with other people and in their community groups, lived longer. The saying the good die young does not hold water. But it is the physical process of ageing that continues to challenge scientists. We are all familiar with the way our bodies change - but the changes that occur at a cellular level are more complex. "Ageing is not really understood," says Dr Stephen Coles, lecturer in the department of chemistry and biochemistry at UCLA and co-founder of the Gerontology Research Group. "It is clearly a relationship between the processes that go on when a human being develops, based on our DNA profile, and [those that go on] when the DNA runs out of new things to do, because we've achieved the prime directive, which is to go forth and multiply." Coles, who studies super centenarians - people who are 110 and over - explains that the decline starts after we turn 30. "The ageing process takes over in a ruthless way that... attacks all biological organisms." One area of research into ageing, at a cellular level, focuses on the role of telomeres. They are the protective tips found at the end of chromosomes, sometimes likened to the tips of shoelaces. Their role is to safeguard the end of the chromosome and to prevent the loss of genetic information during cell division. Telomeres shorten or become damaged every time a cell divides and cell replication stops altogether when telomeres become too short. Shorter telomeres have been linked with high risks for diseases such as heart disease and dementia. "Shortened telomeres are clearly bad," says Coles. "Anything that one can do to lengthen them would be advantageous." There are a number of products on the market that claim to lengthen telomeres. Simply put, they could stop cells from ageing, although it has not been established whether this could extend to an anti-ageing effect on the entire body. But for all the efforts of scientists and psychologists to discover every last secret to living a long life, the maximum age most us can expect to reach is in the late 70s or early 80s. So what is the best way to die? "Many geriatricians and gerontologists joke about this," says Small. "They say they want to live to be 95 years old and die from a bullet shot from a jealous lover. So the idea is to stay engaged, to stay involved, to enjoy your life, but when your time comes, to accept that and not be afraid of it."